Remodeling For The First Time? Glad You Found Us - We Can Help. Remodeling for the first time can be downright frightening. Lets face it if you are like most people your home is the single largest investment you will ever make. With so much at stake it's no wonder there is a lot of anxiety associated with the process. That being said, just keep in mind that a successful project is not only visually satisfying but financially rewarding as well. There is usually a nice (roi) return on investment depending upon the type and size of project completed. No matter what type of home improvement project you are considering, there are specific steps you must take to make it a success. There are also many questions to ask yourself before even getting started. We will cover these in detail shortly when we review our Master Plan. 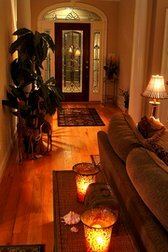 Remodeling101.com will answer your questions and take you step by step through the entire process. Remember all projects no matter how large or small require the same steps and considerations. The larger ones just require more of them. We'll also take a look at real dangers that can be lurking in your home and show you how to eliminate them and keep your family safe. As well as money saving tips to consider during your remodeling endeavor. So lets get started with our Master Plan to creating your Dream Home! 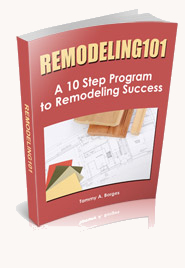 Don't have time to read through the 100 plus pages of information remodeling101 has to offer? Short cut the process by checking out the condensed version of the 10 most important steps you need to take to make your project a success. Click the image to the left to see what is included in this must have guide. With this easy to follow plan, you will arm yourself with all the information needed to be in charge of the process instead of becoming just another victim. There are many decisions to make that can effect the outcome of your project. Will you make the right ones? How will you know? For those of you who have already started a remodeling project you may want to jump right into one of our design areas. Learn helpful hints for designing your perfect kitchen or choosing just the right lighting. I promise to use it only to send you Remodeling Success Tips. Remodelers Tidbits Blog is the place to find relevant news and valuable insider information about the remodeling process. A careful and in depth plan will help your remodeling project become a successful reality. Learn Designing Basics to Help Create the Home of Your Dreams. Creative designing need not be costly but shoud be unique and show your style. Learn designing basics to help create the home of your dreams. What Level of Professional Help Do You Need? Choosing the level of professional help required on a project can be difficult. Get free advice to help make an informed decision. Contractor selection. How to hire reputable contractors. The right contractor selection can mean the difference between success and failure of your project. Learn how to identify a reputable contracting firm. Electrical Planning - Everything from 3 Way Switch Wiring to Home Automation. 3 way switch wiring is only one type of wiring to consider when laying out your remodeling electrical plan. Be the Envy of Your Friends and Create Your Perfect Designer Kitchen. How would you like a designer kitchen like those in the magazines? It can be done if you know how. Closet storage systems are a must for functional, organized storage. Learn to create a healthy lifestyles through design. Your home's flooring can play a multitude of rolls. It can be an eyepopping focal point or just blend into the background and be part of the overal design theme. So many decisions. So little time. Need help making the right remodeling choice? Save energy, save money, save the environment. Yes you can achieve all three. Is your home suffering from SBS? Sick building syndrome contamination is becoming a serious health concern. These additional resources will assist you in making informed decisions regarding your remodeling project. Remodeling101 site map will help you locate important information quickly. If you would like to know a little bit about me and why I created this site, you can check it out here. My way of giving back. Won't you please help one of these wonderful charities. Please contact us with your feedback and we will try to incorporate all suggestions either on our site or in our e-zine. © Copyright 2012. All Rights Reserved. No Reproduction Permitted Without Permission.